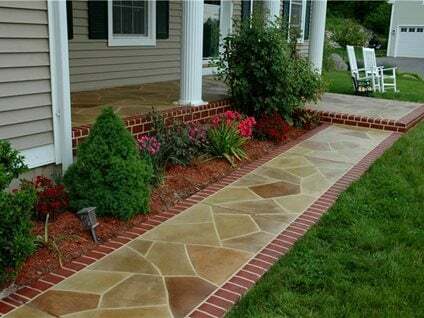 Concrete sidewalks come in a close second to concrete driveways in the amount of traffic they receive. And just like driveways, they are often treated with deicing salts in the winter. All that wear and tear and chemical abuse can take a toll on the appearance of concrete walkways by causing abrasion, spalling, stains and freeze-thaw damage. 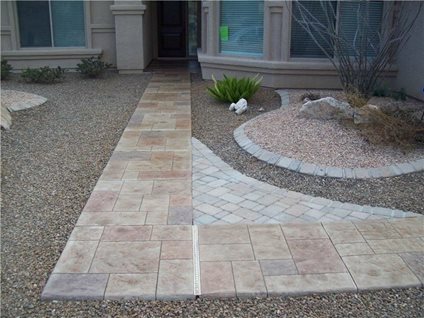 The good news is that if the damage is superficial, as is often the case, it’s possible to restore and upgrade the appearance of your concrete walkway rather than go through the expense and hassle of replacing it. Resurfacing with a cement-based overlay or microtopping is a cost-effective option for adding a decorative touch to an existing concrete walkway while covering up minor flaws and discoloration. 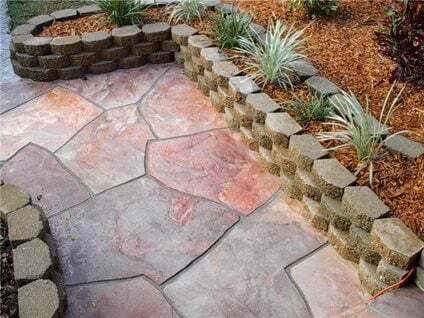 After the overlay is applied to the existing concrete, it can then be stamped, stained, stenciled or engraved to add color or simulate the look of brick, stone, tile or slate. 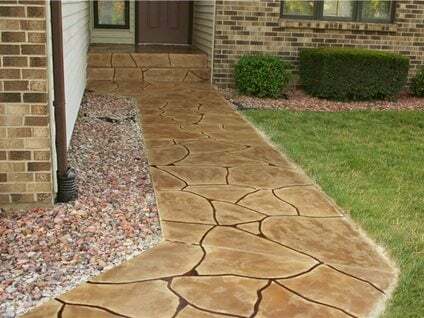 Before beginning a concrete walkway resurfacing project, be sure to consult a professional to determine if your concrete can be resurfaced successfully. If the concrete slab is settling or is badly cracked, resurfacing may not be a viable option. This concrete walkway and steps were transformed with a colored and patterned overlay. Faux grout lines were created by taping off the flagstone pattern before the overlay was applied. A polymer overlay with a hand-taped stone pattern and brick border gave this existing concrete entryway new life. This concrete walkway was rejuvenated with a concrete overlay stamped in a seamless Italian Slate pattern and hand painted with water-based antiquing stains. To replicate the look of inlaid slate, this concrete sidewalk was covered with a gray-colored cement overlay to create the look of a grout base. The slate pattern was delineated with duct tape, and then an acrylic cement topping was applied and hand painted to create a marbling effect.